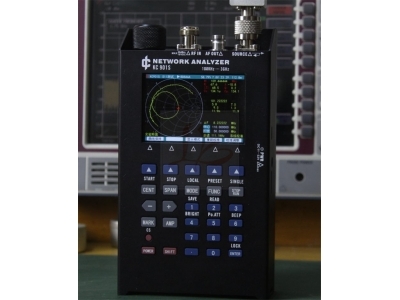 formal vector antenna analyzer for personal application development. 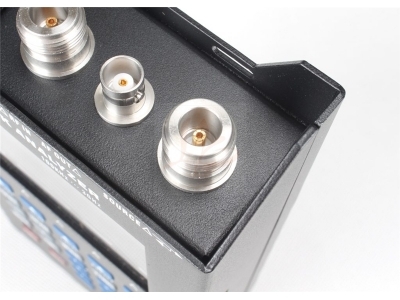 It supports single port vector network analysis and dual port scalar network analysis, and extends the spectrum, field strength and signal generator and so on. KC901S with professional practicality and, including support for five hours working load cell,, volume only 1 DM3, weighing only 1 kg, for users to bring new experience. 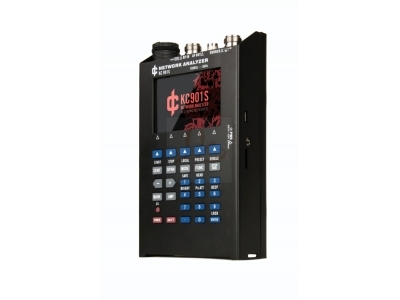 KC901S mainly for debugging radio frequency (RF) circuits, such as filters, amplifiers, splitter, synthetic circuit breaker, test input and output impedance, evaluation quality of the antenna feeder system, equipment levels of the signal amplitude detection. In most frequency bands, the field strength measurement and interference search can be carried out. 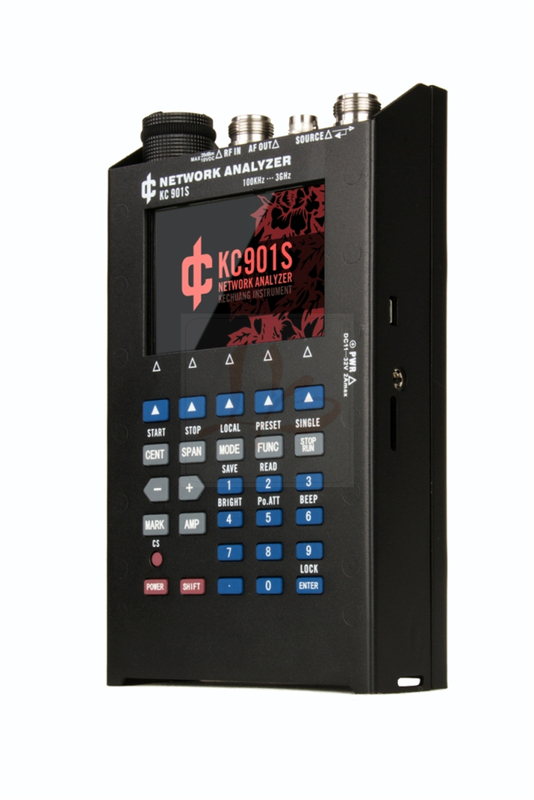 KC901H is a favorite of the scalar network analyzer products, stereotypes in three years ago. Since three years, the majority of users and players have put forward a lot of valuable suggestions. 1, the appearance of the obvious difference, KC901S uses a more comfortable keyboard, while the integration of the degree of improvement, the size of the length of the KC901H reduced by nearly 3 cm. 2, the difference between the function, S11 KC901S function fully support vector test, the performance of the measurement of the reflection of a substantial increase, in addition to the low frequency signal source function (frequency as low as 3Hz). 3, the frequency range of the difference, S11 KC901S function can be effectively used to lower than the frequency of KC901H, S11 300KHz function can only work effectively to 1.5MHz. 4, the difference between the data interface, KC901H no data interface, KC901S has a USB interface and microSD memory card, you can easily access the results of the measurement. 5, the difference between the user experience, FPGA uses the KC901S to deal with high-speed data, the operation of fluency has a fundamental improvement; software uses a new generation KC platform, more easy to use. 6, longer life, KC901S in the maximum power consumption mode, the battery can be 4 hours (optional 5.5 hours), while the weight is reduced by about 200 grams. 7, built-in Barometer / altitude meter. Frequency 1Hz, level 0.01dB, phase 0.01 degrees, atmospheric pressure 0.1hPa, height 0.1m. When the transmission test, external 10dB attenuator can be improved to 1.2 of the standing wave. The instrument can be set faster, but the error increases. Users can be based on the demand for speed and the accuracy of the need to weigh the choice. When the temperature falls below -10, the alarm is triggered, the instrument will automatically slow down the measurement speed, and does not affect the measurement. When the temperature falls below -30, the liquid crystal panel needs to be warm up. Temperature rise to 85 degrees Celsius, altitude table failure, the screen may appear pattern, after the normal temperature, can be returned to normal. Exceed 0...... Using a range of 45 DEG C, should be used for continuous operation, 1 minutes warm-up, user calibration, and shall do a good job in the labor protection, to avoid frostbite, burns. There may be permanent or occasional abnormal data points, the uncertainty of these abnormal data points is worse than the published index. Recommended verification period is 1 years.